The first of the year’s big car shows, the oddly named North American International Auto Show, opens in Detroit next week. It should be the most upbeat event in years. The spectre of bankruptcy has been lifted from the city, and the industry is looking for the current sales boom to continue in 2015. But don’t expect those glad tidings to resonate on the show floor. Absent some well-hidden surprises, there are few important new models due to be unveiled this year, and the supply of fanciful concept cars has all but dried up for economic and competitive reasons. At the same time, the plunge in oil prices has taken the shine off advances in alternative fuels. Which is not to say that there will be any lessening in the flow of news—or noise—coming out of the show. The beginning of the New Year is usually a slow time for real news, leaving a vacuum for manufactured events to fill. The marketing and communication machinery of the manufacturers will be turned up to full volume to take advantage. And, to be candid, automotive journalists such as myself have a vested interest in making the ordinary seem exceptional. How else to justify a trip to Detroit in January? Detroit has become more enamored of high-horsepower cars than at any time since the 1960s. Back then, when gasoline was 25 cents a gallon, big open-throated V-8s like the Dodge Charger and Pontiac GTO displaced more than 400 cu. in. and generated as much as 450 horsepower. Sales were small but publicity and attendant bragging rights were very high. That generation of muscle cars died in the 1970s, killed off by stratospheric insurance rates, the first oil embargo, and the Clean Air Act.. Now big horsepower is cool again, in a rebirth that eerily parallels the unexpected plunge in gasoline prices. The new era was born last fall with the arrival of the 707-hp Dodge Charger SRT Hellcat that is said to be capable of reaching a top speed of 202 mph. 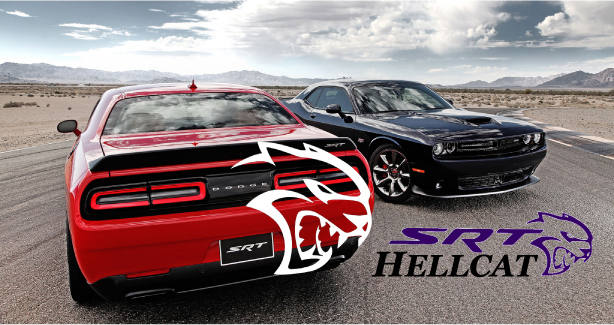 The $64,990 Hellcat has enthusiasts over the moon. Forget the fact that Car and Driver reports that its 376 cu. in V-8 is capable of burning 1.5 gallons of premium gasoline “in a minute flat” at that velocity. The business case for muscle cars hasn’t changed–it is still minimum volume, maximum visibility — but that isn’t stopping the rest of Detroit from getting in on the fun. At the Detroit show, Cadillac will reveal the CTS-V, powered by a Corvette engine that produces 600 horsepower, and likely to be priced around $85,000. Meanwhile, Ford F -1.36% is expected to display a Mustang Shelby GT350 with a motor that makes 500 horsepower. A new generation of drivers will get to release their inner Jeff Gordons but you have to wonder about all those pious declarations from years past about climate change and environmental sensitivity. Barra has been in place for only a year, but people can’t stop analyzing her performance. Last year’s Detroit show was Barra’s coming-out party as GM’s GM -1.69% first woman CEO, and her public appearances caused such a commotion you’d think she was Taylor Swift. The succeeding 12 months have been tough for Barra, as she was made the public face of GM’s never-ending product recalls. She has been properly apologetic as GM tries to wash the mud from its public image, vowing to remake the company’s culture. But somebody forgot to tell her the first rule of crisis management: Get all the bad news out at once. GM has been recalling cars seriatim since February and has given no sign that it is finished. Barra’s plans for the 2015 show are still private, but it wouldn’t be surprising to see her onstage when GM presents the next-generation Chevrolet Volt – hopefully before it’s recalled. In 2007, Changfeng Motor became the first Chinese auto manufacturer to exhibit at the Detroit show. One or another Chinese maker has shown up most years since then—but to little effect since Chinese vehicles have yet to be sold in the U.S. This year, Guangzhou Automobile Group, which exhibited several cars at Detroit in 2013, is returning and will show what’s been described as a “high-performance, compact SUV.” A state-owned company that is China’s tenth largest car maker, Guangzhou wants to show that its vehicles “meet international standards.” We’ll wait to see if it can succeed where BYD, Chamco, Geely, Brilliance, and, oh yes, Changfeng, have failed, but we aren’t holding our breath. Alan Mulally is still treated as a demi-divinity around Detroit, ranking up there with real-estate mogul Dan Gilbert and Detroit Lions Defensive Tackle Ndamukong Suh. He’s best known for pruning Ford of excess brands and boosting efficiency by marketing the same models overseas that it does in the U.S. But Mark Fields, who succeeded Mulally as CEO in July, must be wondering just what else his legacy consists of. Fields is dealing with disappointing fuel economy numbers turned in by the much-heralded F-150 pickup, as well as sales shortfalls blamed on the slow launch of the aluminum truck, and below-par product quality ratings. He’s shaking up marketing in surprising ways, even importing a veteran GM’er, and Detroit will be watching to see his next moves. The paucity of successful mergers among automakers over the years hasn’t never stopped speculation about possible new combinations and the rumor mill is churning again. The instigator this time is FCA CEO Sergio Marchionne, who has long spoken about the importance of scale (and FCA’s shortcomings in that area). Now, with Chrysler thriving and the planned spinoff of 10% of Ferrari underway, he is hinting that he wants to do more. A Bloomberg report describes Marchionne’s longings and identifies Volkswagen, General Motors, and Ford as potential FCA partners. But it is important to remember that mergers always look better on paper. Just ask Daimler chairman Dieter Zetsche, whose company owned Chrysler before FCA did. The traditional four-door sedan may survive for years as an artifact of an earlier era, but its last days as an industry standard are coming into view. It is being replaced by the crossover/ SUV. Sales of the utilities in the U.S. jumped 12% last year in an industry that rose 6%, and they now account for nearly one-third of new vehicle sales. Honda’s CR-V, the top-selling crossover, even outsold all passenger cars for the last two months of 2014, according to sales analyst Timothy Cain. The CR-V set an all-time record for sales volume in 2014, as did the Ford Escape, Toyota RAV4, Chevrolet Equinox, Nissan Rogue, Jeep Wrangler, and Subaru Forester. Evidence of the sedan’s decline has been building for several years, but the crushing blow came with the disclosure this week that Rolls Royce, that most hidebound of manufacturers, is considering whether to add a crossover/SUV to its lineup of limos and coupes. An executive told Bloomberg a decision would be made his year. Next thing you know, Lord Grantham will be contemplating the addition of a media room and hot tub to Downton Abbey. 0 comment(s) so far on 2015 Detroit Auto Show!